More Than A Smile patients have access to the most highly trained and certified orthodontist in Williamsville, NY, Elma, NY and Orchard Park, NY. Dr. Kohout has been practicing dentistry in the area going on four decades. He is proud to be part of a thriving practice whose roots in the community go back to 1957. Since then, More Than A Smile Orthodontics has been committed to providing a state-of-the art approach to orthodontic treatment for thousands of happy patients throughout western New York. Dr. Kohout still loves getting to know his patients and the excitement of watching their smiles grow as their treatment progresses. 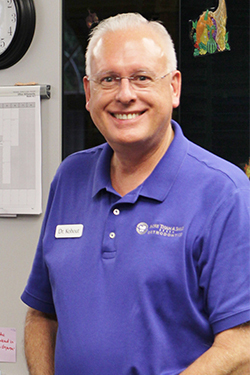 Outside the office, Dr. Kohout enjoys playing the saxophone, watching sci-fi movies, and cooking anything and everything on his beloved Weber grill. He also appreciates the great variety of outdoor fun no matter the season – skiing in the winter, summers on the waterfront, downtown parks, Niagara Falls – Buffalo has it all! Dr. Kohout earned both his Bachelor of Science and Doctorate in Dental Surgery from the State University of New York at Buffalo. He went on to receive his Orthodontic Certificate from Loyola University in Chicago, and is also a Board Certified Orthodontist in Williamsville, NY, Elma, NY and Orchard Park, NY. Dr. Kohout has served in many prominent academic leadership roles on both the local and national levels, including Diplomate of the American Board of Orthodontics, Fellow at the International College of Dentists, and Past President of the Erie County Dental Society, the Eighth District Orthodontic Academy, and the Delta Sigma Dental Fraternity. Dr. Kohout has been an active participant in the Clarence Rotary Club for the past 30 years, supporting its core mission of both benefiting the local community and promoting world understanding. He and his wife have also been active members of the Chapel at Crosspoint for many years. For more than six decades, More Than A Smile Orthodontics has been a cornerstone of support to the greater Buffalo community. The practice also regularly contributes to a host of community civic and non-profit organizations, local schools and youth sports teams, as well as music and art programs. Schedule an Appointment with Our Award-Winning Orthodontist in Williamsville, NY, Elma, NY or Orchard Park, NY, Today! For an appointment at our 5-star-rated orthodontist in Williamsville, NY, Elma, NY, or Orchard Park, NY, call 716.633.4747. To use our convenient online appointment request form, click here. We look forward to helping you achieve your best smile!